CONVENTION: SANRAL Southern Region hosted its first annual Indlela Yam, My Way, My Journey convention for grade 10 to 12 learners, in Port Elizabeth. 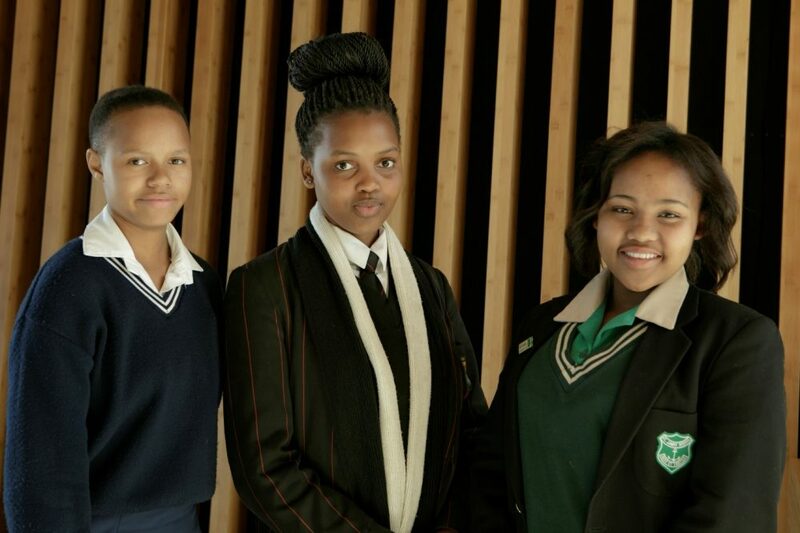 Some of the learners who attended were from left, Lindokuhle Siya, 16, a Grade 10 learner from EZ Kabane High School, Mpatlalatsane Tsieane, 17, a Grade 11 learner from Newton Technical High School and Inette Mapoe, 16, a Grade 11, St James Roman Catholic High School. Port Elizabeth, 28 August: High school learners from Nelson Mandela Bay attended a career development conference with leading businesswomen and academics during the South African National Roads Agency’s SOC Ltd (SANRAL) Southern Region’s first annual Indlela Yam, My Way, My Journey Convention held in Port Elizabeth this weekend. The aim of Indlela Yam, My Way, My Journey convention is to promote career development for learners and to expose them to the various professions in the roads and transport industries. Guest speakers’ topics included Know Yourself by motivational speaker Kuhle Bavuma; Careers my future – how and where to go by SANRAL’s Nandipha Frans and Rhona Erasmus; and Why women in roads and paving your way forward by civil engineer Lindokuhle Mahlangeni and candidate engineer Zintle Nxadi. Other speakers included SANRAL Civil Engineer Lindelani Tsanwani who spoke about Siyaphambili with training and community development; SANRAL’s Candidate Engineer Nozipho Ngomane spoke about Running your journey with endurance; Civil Engineer Noloyiso Bavuma spoke about entrepreneurship in engineering; Industrial engineer and businesswoman Violet Lupuwana’s topic was Start, build and own your Crown; Chartered Accountant and Nelson Mandela University Lecturer Lindiwe Mangisa-Mabele spoke about Achieving your goals against all odds; and Public Relations specialist Sesethu Gqomo of Sesethu Gqomo Communications, spoke about Standing out from the rest with staying focussed while dealing with peer pressure. SANRAL’s Candidate Engineer Malesiba Mabe and Nandipha Frans who is SANRAL SR’s Technical Excellence Academy Secretary initiated the Indlela Yam, My Way, My Journey Convention. “The convention promotes career development for the learners. As a roads agency we also want the learners to know about the different career paths and opportunities in this industry,” said Mabe. The programme exposed the learners to the different careers and promoting healthy living lifestyles while working towards their goals. Among the topics discussed were gender inequality, the importance of knowing yourself, training and community development, entrepreneurship in engineering, how to reach your goal against all odds, and how to stand out from the rest without giving into peer pressure. Mpatlalatsane Tsieane, 17, Grade 11 learner from Newton Technical High School said she was inspired and motivated by the guest speakers. “Civil engineering and construction management are two of my career choices. Before today’s convention I had no idea where to apply for bursaries to study civil engineering. I have learned that being a civil engineer is not an easy road but a possible one and I am inspired to work hard towards my dream,” said Tiesane. Inette Mapoe, 16, Grade 11, St James Roman Catholic High School learner. She would like to be a doctor or social worker. She called the event “awesome”. “Coming here was inspiring. To hear where these speakers come from and what they’ve reached with God’s will, perseverance they can do anything,” Mapoe said. “At SANRAL we are passionate about career development and training. Today’s programme was another commitment from SANRAL to empower young minds,” Frans concluded. Next: King Price just turned 5… Can you say ‘older and wiser’?